Place 10 pop sticks in a bowl of warm water. Combine 1 cup peaches and blueberries and coarsely chop together (fruit should remain chunky). Loosely fill pop molds with fruit. Combine remaining peaches, nectar and sugar in bowl of blender or food processor; blend until smooth. Pour juice over fruit to fill pop molds. Poke fruit with a bamboo skewer or thin knife a few times and tap bottom of mold on counter a few times to release any air bubbles. Place lid on top and insert damp pop sticks. 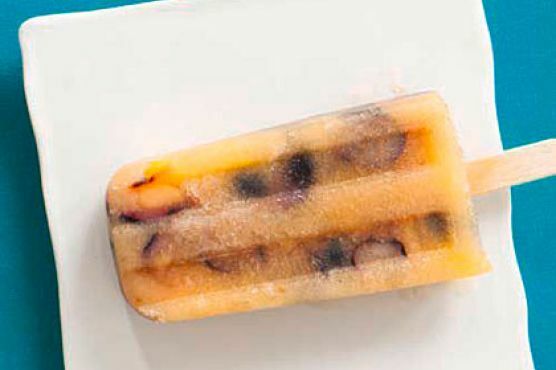 Place mold in freezer and freeze for 8 to 12 hours. To unmold your pops: Fill the kitchen sink with lukewarm water. Run water over the lid a few times to loosen it. Swish the bottom of the mold through the water 5 or 6 times to loosen the pops. Place the mold on a clean kitchen towel and pull up on the middle sticks to remove all 10 pops and the lid. Swish in water again if all the pops and the lid don't lift off. Then remove the pops from the lid. Store the pops in the freezer in a single layer in ziplock freezer bags.